Perennial. Zone 1. Apiaceae, formerly Umbelliferae. Europe, Northeast Asia. Aka HANSEL-AND-GRETEL, JACK-JUMP-ABOUT, BISHOPSWEED, SNOW-ON-THE-MOUNTAIN, GROUND ELDER. 12 to 16 inches tall; spread infinite. Any soil, average moisture, sun to shade. Aegopodium is derived from the Greek aix or aigos (a goat) and pous or podos (a foot), from the fancied resemblance in the shape of the leaves to a goat’s foot. Podagraria comes from the Latin word for gout, podagra, because this plant was highly valued as a treatment for that ailment in medieval times. 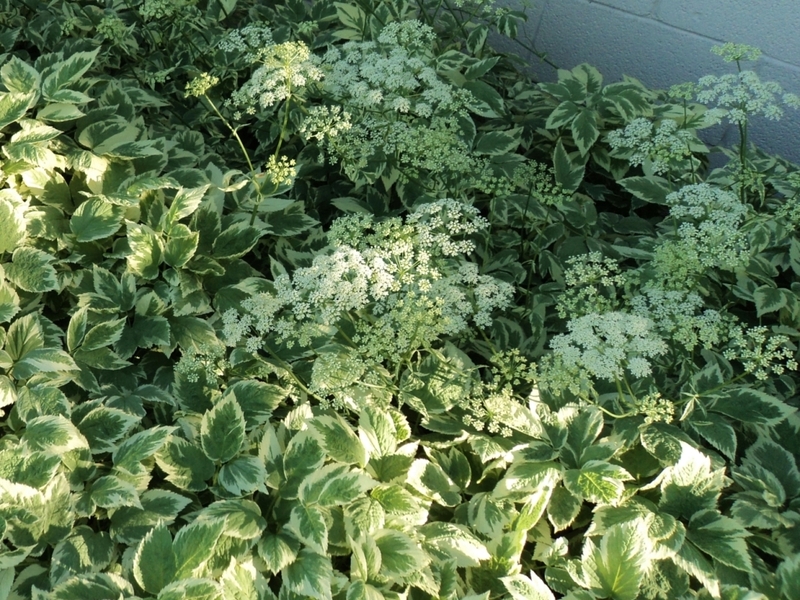 Goutwort is an attractively variegated pale green and ivory foliage plant, though it does produce umbels of tiny, creamy white flowers in summer. 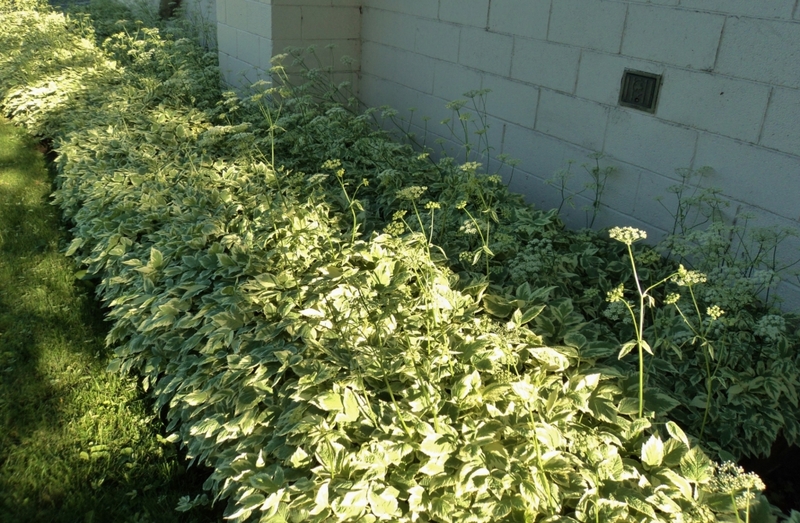 It is an insidiously invasive but very valuable groundcover for difficult sites. A solid edging or path will generally contain it. Avoid planting in a mixed border, as it will gobble up less rambunctious neighbours. I have had success growing it with other hold-your-own plants, namely with Lily-of-the-Valley (Convallaria majalis), Ribbon Grass (Phalaris arundinaceae ‘picta’), and Joe-Pye Weed (Eupatorium purpureum), but I do believe it is generally best alone, in a place where it can flourish to its (and the gardener’s) heart’s delight. It has a creeping root-stock and by this means it spreads rapidly and soon establishes itself, smothering all vegetation less rampant than its own. It is a common pest of orchards, shrubberies and ill-kept gardens, and is found on the outskirts of almost every village or town, being indeed rarely absent from a building of some description. It is possible that Buckwheat might drive it out if planted where Goutweed has gained a hold. It was called Bishopsweed and Bishopswort, because so frequently found near old ecclesiastical ruins. It is said to have been introduced by the monks of the Middle Ages, who cultivated it as a herb of healing. It was called Herb Gerard, because it was dedicated to St. Gerard, who was formerly invoked to cure the gout, against which the herb was chiefly employed. The white root-stock is pungent and aromatic, but the flavour of the leaves is strong and disagreeable. (However) Linnaeus recommends the young leaves boiled and eaten as a green vegetable, as in Sweden and Switzerland, and it used also to be eaten as a spring salad. A poultice made from the boiled leaves and roots was used with reportedly good effect as a treatment for all sorts of joint pains. Nowadays this plant is grown strictly as an ornamental, and it is a very good plant for difficult sites, as long as its land-grabbing habits are taken into consideration. Propagation of the variegated form is by division; it seldom sets viable seed. There original species is solid green, even more vigorous than its creamy-leaved sport, and a profuse self-seeder. 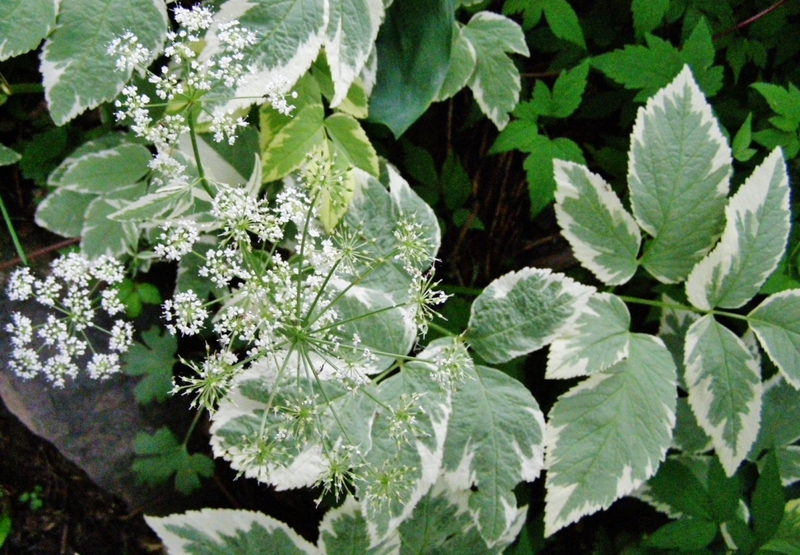 Luckily it is not at all common in our country – the variegated version is sufficiently successful in our gardens. Bishop’s Goutwort is frequently seen in old gardens and around abandoned homesteads. A particularly nice Cariboo planting is behind the Theatre Royal in the restored 1860s’ Gold Rush town of Barkerville, B.C., where it thrives in a lush colony hemmed in by Mountain Bluet (Centaurea montana) and Lady’s Mantle (Alchemilla species), both vigorous survivor-type plants in their own right.